Prototype: 6 different German State Railroad Company (DRG) "Rheingold" express train passenger cars in the paint scheme at the beginning of the Thirties. 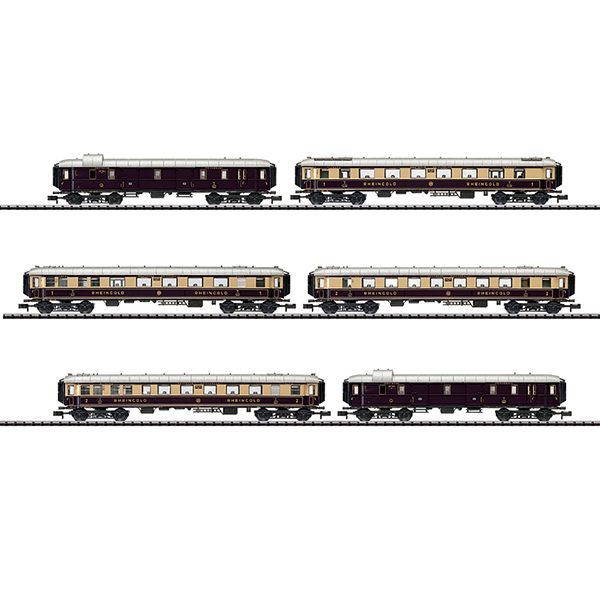 1 type SPw4u-28 baggage car, 1 type SB4uk-28 salon car, 2nd class with a galley, 1 type SA4u-28 salon car, 1st class without a galley, 1 type SA4uk-28 salon car, 1st class with a galley, 1 type SB4u-28 salon car, 2nd class without a galley, and 1 type SPw4u-28 baggage car. Model: The salon cars have lighted table lamps and different interiors. LED interior lighting can be installed later in the salon cars. All of the cars have a close coupler mechanism. Total length over the buffers 832 mm / 32-3/4". The class 18.5 express steam locomotive with a tender, item number 16181, goes marvelously with the "Rheingold" express train passenger car set. The Rheingold - Traveling like Kings. After the catastrophe of World War I and the political upheavals in Europe, traveling began to grow again in popularity. The railroad was used almost exclusively for long distances, since it promised a fast, comfortable mode of conveyance. The sleeping and dining car firms run under private ownership dominated in long distance service. They offered an extensive palette of services up to and including the ultimate luxury. The German State Railroad Company (DRG) did not want to sit on its hands and do nothing with regard to its competition, and this new, self-confident firm was determined to underscore its presence on European rails with a deluxe train possessed of an international quality. In 1927, the German State Railroad officially disclosed the order for express train passenger cars to form long distance express trains, which were intended to represent innovation and comfort by rail. The "Who's who" of the German car building industry participated in the building of these cars, among others, the firms Waggon und Maschinenfabrik AG, Görlitz and the Waggonfabrik Wegmann & Co. A total of 26 Rheingold parlor cars were built: 4 cars, 1st class, type SA4ü, with seating for 28, 4 cars, 1st class, type SA4üK, with a galley and seating for 20, 8 cars, 2nd class, type SB4ü, with seating for 43, 10 cars, 2nd class, type SB4üK, with a galley and seating for 29. For their time they represented the longest German cars with a length of 23.50 meters / 77 feet 1-3/16 inches. The bodies were constructed entirely of steel and the total weight was between 50 and 52 metric tons, i.e. up to 12 metric tons more than a conventional express train passenger car. Trucks (Görlitz II heavy) were developed just for the "Rheingold" series. They had to withstand high train speeds and had a wheelbase of 3.60 meters / 11 feet 9-3/4 inches. In addition, there are also 3 baggage cars, type SPw4ü, each with a length over the buffers of 19.68 meters / 64 feet 6-13/16 inches and facilities for goods in bond and for transporting pet dogs. The extremely elegant paint scheme for these prestigious cars attracted attention and interest. Initially, the color scheme for the outer surface of the cars was a kind of plum color with the pier panels in cream, later violet / cream with the widely known golden "Rheingold" lettering. The interior space of the cars offered the highest level of luxury, in first class even individually upholstered armchairs with high backs. Attention was given to the different wishes of the passengers, so that there were compartments as well as large open parlor areas. The Rheingold had to face comparisons with the Orient Express right from the start, and the passengers enjoyed luxury in the parlor cars, as only crowned heads of state had known it in the past. The interior conformed to the taste of that time. Famous German artists and architects participated, and the influences of the artistic avant-garde school for building and design in Dessau were reflected, with names such as Walter Gropius, Mies van der Rohe, or Paul Klee involved. The best care was offered to passengers at their seats in the trains running between Basle and Hook of Holland. Customs and passport control were done in the train during the trip, an exception for that time, but one that shorted the travel time considerably. All of the railroads that participated in the operation of the train were convinced of the significance and importance of this train, and it was natural that the most powerful and beautiful locomotives were used as motive power for the Rheingold. The outbreak of World War II brought the Rheingold to an abrupt end, and its cars were stored during the war or put to special uses for the German army and the Red Cross and after 1945 for the occupation forces.